the story of my drastic style change. Today I'm going to be telling you all about the heavy transformation I went through about two years ago! 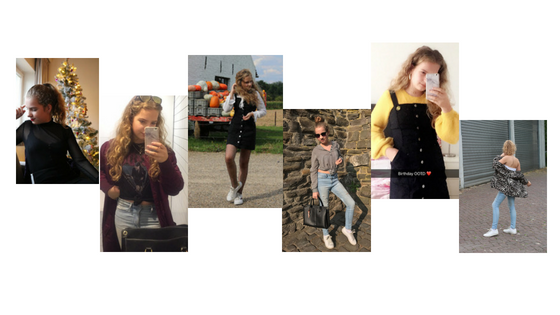 This article is going to be the first post in a 2 post series about big style transformations, with the first one being my personal story and the second one being all about finding your style and tips on changing it. Let's just get into my story first! If you've ever seen my Instagram, or have met me irl, you probably know that I wear almost no colour. I always get asked why I don't wear (a lot of) color. In fact, I get this question so often that I had to include it in my Instagram FAQ. 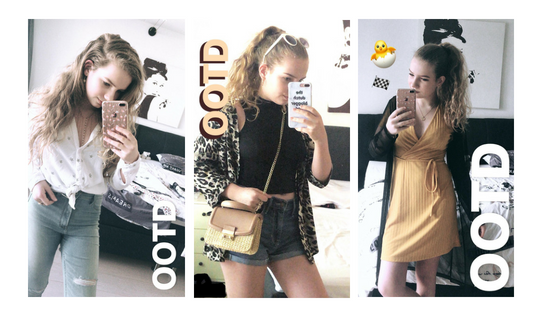 I do think it's an interesting story though, so today I thought I'd tell you the story of my drastic style change, which tells the tale of a very different me, and is basically the origin story of my neutral style. So picture this, the year is 2016, and I am a lot smaller, a lot less funny, and a lot younger looking. My closet is full of pastels and colour. Colours everywhere! If you'd ask me what my fave colour was, the list would've probably gone like this: purple, pink, blue, mint, peach and pretty much every pastel colour imaginable. I was a walking rainbow. A standard outfit always looked like this: I'd pick some colored pants, a graphic (colorful!) tee (that probably had either flowers, lemons, an obnoxious quote or an obnoxious print on it, pick your poison), an ill-fitting jacket, shoes that always matched my jacket, preferably with a print like watermelons or with annoyingly bright neons and some dumb bracelets. I basically dressed like a child, and on top of that I looked like a child too. My style was pretty much this: just hop on every trend and you'll be fine. I had discovered Primark a few years earlier, and to say I was obsessed was an understatement. When the moustache trend hit I would wear outfits with a moustache theme, when fringe hit I'd fill my closet with fringe catastrophes. I think it's safe to say I'm pretty much the opposite nowadays, and that's because of 2 things that pushed me to drastically change my style. 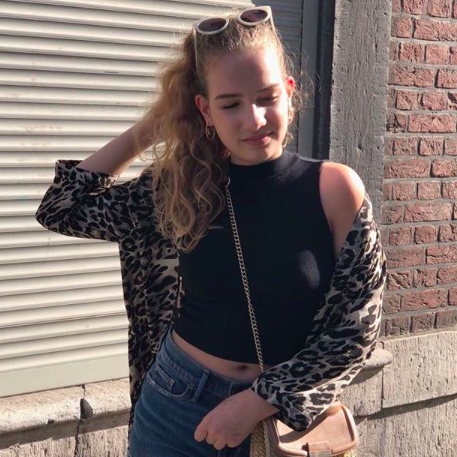 Number one: I didn't want to be perceived as a kid anymore, I was 14 (pretty much a grown up in my mind) and wanted to feel like a responsible adult and a cool, hip teen. Number two: I discovered Kelsey Simone's Youtube channel. Now I'm not gonna lie about the fact that I looked up (and still look up) to Kelsey a lot. 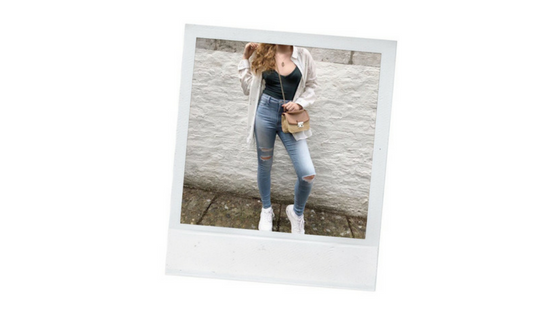 In fact, seeing her put-together style and effortlessly cool outfits made me realize how not-cool I was and how I was pretty much behind on the whole cool-teen thing. I looked at my style and saw that I wasn't happy with it anymore. I decided I could sit around and be unhappy, or change everything I stood for and chase the life I wanted. I chose option number two. Around January 2017 I completely threw out almost all my clothes, donating 6 trash bags full to H&M, and went on a massive shopping spree to get me some new ones, all in a brand spanking new colour scheme of course. The new Sabrina was born. I did a full makeover: I drastically changed my style, I started styling my hair differently, I started wearing more flattering makeup (gone are the days of bright pink lipstick every. single. day. ), started behaving a little more grown up and completely changed my room from a pastel paradise to a more toned down room. And I'm glad I did all of that. I've never felt better than since I changed my style. I started dressing and acting to get a certain lifestyle, and drastically improved my life by that. Don't get me wrong, I'm still pretty much the same on the inside (lame jokes, fandoms, pop culture references galore) and I don't recommend toxically changing yourself when you don't want to, I was just truly unhappy with my style, and hadn't realized that until then. I started reflecting a more put together, slightly less "kiddie" person. Since I've changed my style I've felt more put together, grown-up, confident and just overal happier. Throughout 2017 my style evolved right alongside of me. After a long period of no-colours and a strict black/white/grey color scheme, which was necessary to find out how I wanted my style to evolve, I finally started allowing some colors I truly liked back in. I started wearing shades I never used to wear, like mustard and burgundy, again. Near the end of 2017 I even started experimenting more, allowing myself to just try on whatever I wanted, even if I thought it wouldn't look good on me anyways. I discovered a lot of new things that year, and before that had never experimented more with my style and overal look. (I also finally gathered the courage to start my youtube channel in 2017, so that's amazing as well) I basically decided to wear whatever I wanted and do whatever I wanted, even if it was something as controversial as starting a youtube channel, and just ignoring the haters. 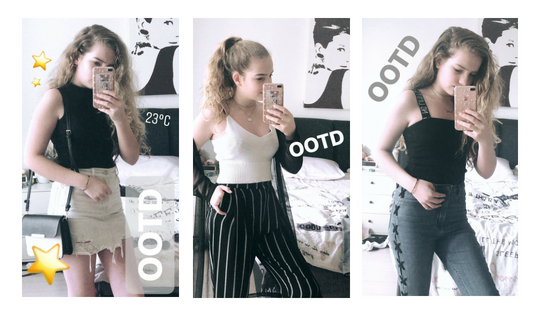 Some of my 2017 OOTD's. Things like the sheer top, red coat or black buttoned dress would've never even made it into the fitting room a few years ago because I would decide upon one look at them that they wouldn't fit me or look good on me. Now, in 2018 I've experimented more with my style than I ever have. I've let more colors in again; olive, burnt orange, red, and blush pink. I've started wearing more street style stuff, and showing myself I CAN be cool enough to pull them of. I've started wearing things not just because they're trendy or someone else was wearing them. I've started taking inspiration from others and mixing them with my own style more. I've taken the basis of my 2017 redone style, and have evolved it and, in my opinion, exceeded it. My style started through copying others, and I can finally say now that my style is truly my own, home-brewed mix of elements, and I'm so proud of that and all I have become. Anyways, that was it for this article! I hope you enjoyed reading this article, I worked so hard on it, and it's definitely very new to me to write very personal stories on here. If you enjoyed definitely leave a comment saying so :). I love Kelsy as well. I also went to a huge style change, but the different is, I didn't through away my old items. I kept them and I now wear them in a new modified way that suit my style and it works just fine for me. I just love changing my style up ... it's so fun isn't it? Such a lovely read dear. Congrats on finding your own style. Indeed, our style changes (or evolves) through time, and recognizing how much you have changed is actually a great thing. Thanks for sharing your thoughts dear! all the trends you want to hop on for summer.